The Japanese yen will hold its own as a safe-haven currency in 2012, while the dollar will be less ugly than the euro, analysts forecast. Based on relative economic growth and expected policy rate moves, the outlook for the greenback is encouraging in the months ahead. The eurozone is likely entering a recession. At the European Central Bank's Governing Council meeting on January 12, key interest rates remained unchanged. The Federal Reserve, meanwhile, is unlikely to go much beyond verbal intervention in the markets, as the US economy muddles through. "Reconstruction spending [following last year's earthquake and tsunami] in Japan may help soften the drift lower, but growth in the world's third-largest economy [after the US and China] will be too slow to provide much contribution to the world economy," says Marc Chandler, global head of currency strategy at Brown Brothers Harriman, based in New York. Meanwhile, the European debt crisis, which is extending into its third year, will remain the key determinant for the general investment climate and global capital markets, Chandler says. "The large amount of debt issuance by the region's sovereigns and banks, concentrated in the first part of the year, during a period in which investor confidence has been lost, provides the tinder that is looking for a spark," he says. 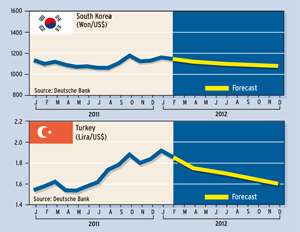 European banks need to raise about $150 billion in the first half of 2012, according to the European Banking Authority. Standard & Poor's has put 15 of the 17 countries in the eurozone on notice that they may face a possible downgrade. "Both the [European] sovereigns and the banks have large sums of bonds maturing in 2012, which risks disruptions to the markets," Chandler says. "One of the results will be a weaker euro, but barring an outright collapse, depreciation is likely to be broadly welcomed by European officials and businesses. A weaker euro is also consistent with easing monetary policy," he says. Brown Brothers Harriman expects China to engineer a soft landing for its economy. "In the generally-firm US dollar environment we are forecasting through the first half of 2012, we expect [renminbi] appreciation to be minimal," Chandler says. However, a report by Saxo Bank chief economist Steen Jakobsen forecasts that China's economy may see lower-than-expected growth in 2012 as the much-vaunted switch to domestic consumption rather than reliance on export markets has failed to materialize. 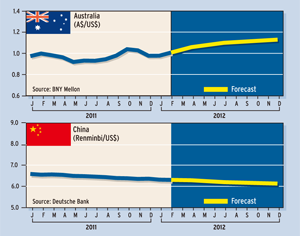 China could face growth in the 5% to 6% range in 2012, instead of the consensus of around 8.5%, the bank says. China is not helpless to mitigate the much-feared hard landing, Saxo Bank says. "China has a weapon that most developed economies do not possess, namely rate cuts," it says. Banking sector stresses, linked to a loss of investor confidence due to banks' sovereign exposures, have led to what is effectively a credit crunch, according to a report by foreign exchange analysts at Barclays Capital in London. "We expect the European Central Bank to continue to loosen policy, by both further rate cuts and ongoing unconventional measures," says the report by Paul Robinson, global head of foreign exchange research, and Sara Yates, foreign exchange strategist. "Prospects for the US have improved somewhat, especially in relative terms and, in contrast to most of the other large economies, monetary policy is unlikely to ease further to any significant extent," the report says. "The mix of an improvement in relative prospects, much looser policy in the euro area, and risk aversion remaining high is likely to lead to the euro depreciating against the dollar significantly over the next year." Bank funding pressures in the euro area are at the highest levels since 2008 and 2009 and are higher than in the US, Barclays Capital says. European banks are also facing pressure to reduce leverage to comply with tighter capital standards and weaker demand, it says. On January 2, 2002, the euro became the new European currency in 12 countries, known as the eurozone, which today has 17 members. Policymakers marked the 10th anniversary of the introduction of the euro by urging governments in the currency bloc to save and consolidate to overcome their debt crises, says Nadia Georgiou, corporate foreign exchange dealer at Western Union Business Solutions in London. 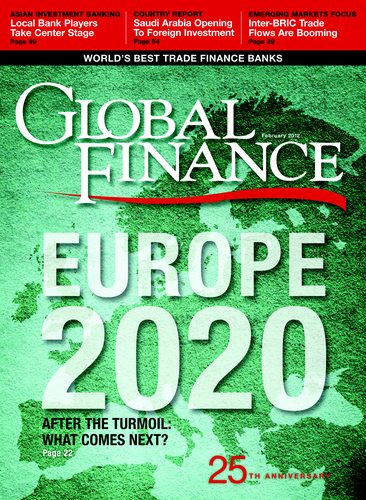 "We head into 2012 in a climate of unparalleled uncertainty," Georgiou says. "The eurozone looks on the edge of a precipice, the US dollar being the main beneficiary of this euro weakness, and global growth as a whole is stalling." The ongoing EU crisis, slowing global demand as the public debt bubble can no longer get any bigger, and rising social tensions, as the gap between rich and poor widens, are the key ingredients for a perfect storm early in 2012, says Jakobsen at Saxo Bank in Copenhagen. "As the EU leaders have failed to address the fact that the banking/sovereign debt crisis is one of solvency, not liquidity provision (and they haven't done that particularly well) a renewed crisis is inevitable," Jakobsen writes in the bank's outlook for the first quarter of 2012. Among the world's currencies, the dollar is likely to perform very well, particularly during periods of risk aversion, as the world continues to deleverage, he says. "The US, as a sovereign currency issuer, does not have a problem financing itself, a position many eurozone countries would kill for presently as they see yields shoot up to untenable levels," Jakobsen says. The agreement on a new EU treaty by March, as decided at the December summit, will be a critical focus in the first quarter, he says. Any refusal of various members of the EU-27 to sign on to the proposed treaty could render their connection to the group tenuous at best, he adds. "The perfect storm is coming, but there is no need to panic," Jakobsen says. The crisis will prove constructive in the sense that it will force the hands of policymakers and politicians, he says. "Ultimately, we need to find a long-term solution anchored by popular support," he says. "But before we get there, we'll see yet another quarter of extending-and-pretending from policymakers that will most likely prove counterproductive and lead us to this new crisis."